Our clinic has an onsite 30 foot long aqua therapy pool designed exclusively for the water therapy needs of our orthopedic and sports medicine patients. It has a three tiered depth of 3’6”, 4’4”, and 7’ in order to accommodate all heights of our patients and the restrictions they may have on their weight bearing. 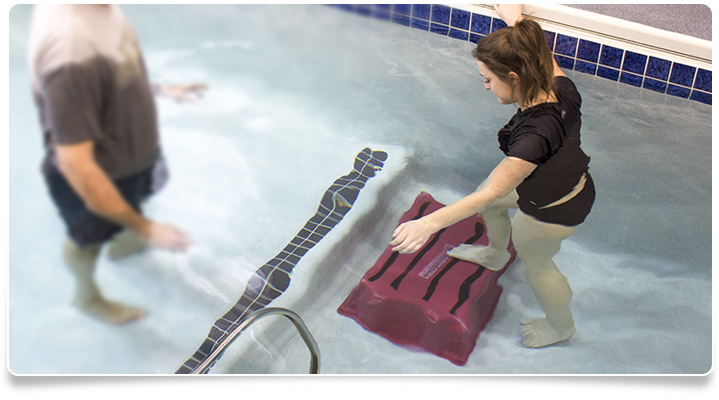 Aquatic therapy is most often associated with a transition to, or integrated with land-based therapy. The buoyancy properties of water are an excellent way to facilitate flexibility and range of motion, as well as to unload compressive forces across the spine and joints. The resistive properties of water provide an excellent alternative to introduce strength and endurance training that might otherwise not be tolerated well on land. Your doctor and/or therapist will decide if a trial in the pool would be beneficial for your condition. Our experience in the pool has shown us that in cases where weight bearing is restricted by the referring physician due to the nature of the injury, or operative procedure, water therapy can accelerate the rehab process making it both cost-effective and time saving for the patient.